Photo by Gary Landsman for Washington Life. Polo events are stylish, extravagant and classy affairs. In Washington, it has become one of the most sought-after summer sports to attend or participate in. 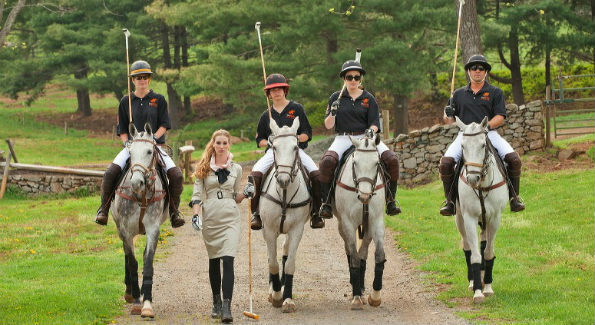 Check out the pics from the Veuve Clicquot Polo Classic this past weekend in New York, see who was there and get excited for our own polo season this year. … and speaking of extravagance, Napster founder and former president of Facebook Sean Parker‘s $10 million dollar wedding has ecologists none too pleased about “enhancements” made to the wedding site. Too pricey? Check out how much someone spent on a fake Lady Gaga nail at a recent auction. Ever wonder what happens to the clothes that are too worn to be given away? Check out this article on why NOT to throw them out and WHERE to go to donate them. Whether you need a cover-up or something versatile that you could just throw a necklace over and go out in, tank tops often do the trick. And there’s plenty to choose from. Not sure which are the best? Top 10 tank tops here. Need an accessory? Try the hottest trend in turquoise. What about summer sandals? Here are some of the best for 2013. Looking for a classic top that transitions from day to night? We like Valentino’s two-tone lace blouse. Want something a bit edgier? Giambattista Valli’s lace peplum top might be just the ticket. And while we’re talking about shopping, Saint Laurent opened a brand new Soho store this week, offering the designer’s latest collection, as well as its Permanent Collection. If you love the look of false eyelashes but are sensitive to most brands of glue, you might want to try this new line — Winks by Georgie. Purchase here. A new “trend” in exercise is popping up in the health world, but you have to have absolutely no shame (or are in media) to embark upon it. See what the fuss is all about. But be forewarned. It’s a little embarrassing. The upside? It might actually help tone your backside. Want a solution that’s less harmful to your reputation? The “Four Weeks to Sleek” program from Barry’s Bootcamp and Clarins might be right for you. For a real-world perspective, click here. For more posts from Nichole, visit here.